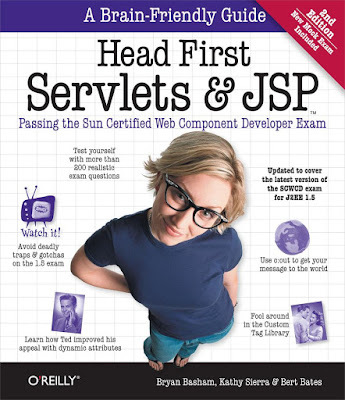 Unfortunately, there are not many good books to learn Servlet and JSP for Java web developers. Despite being the most popular Java Web technology, there are very few good books to learn Servlet and JSP. The one book, which everybody will suggest you is the Head First Servlet and JSP, which is indeed one of the best books but it's outdated now. It doesn't cover the latest development in Servlet API, particularly Servlet 3.0 and also not been updated for last 7 to 8 years, but considering others, it is still a good book to learn Servlet and JSP. The main advantage of this book is Head first style which is great for beginners. With lots of repetition, bullet points, fireside chats, Head First book make sure you understand things and not just read them. Since many readers ask me to suggest good books learn Servlet and JSP, I'll share a couple of title in this book, which I think is relevant and help you to learn Servlet and JSP better. Another reason, programmers learn Servlet and JSP is for being an Oracle Certified Web Component Developer i.e. OCPJWCD, if you are learning Servlet and JSP with that certification in mind, I suggest you read this study guides, they are excellent from exam perspective, but for real world development perspective, you need a book which is more focus on examples and how to do things in Servlet and JSP stuff. 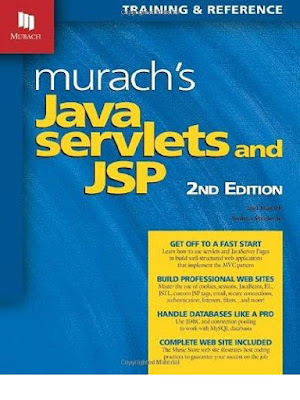 Murach's books are great books for a beginner in general and the Murach's Java Servlets and JSP, 3rd Edition meet the expectation. It is currently the best book learn Servlet and JSP from scratch. It not only teaches you about Servlet and JSP but also about other related web technologies e.g. JSF, HTML5, CSS3 etc. It gave both text and example to work with and explains how to develop JSP-Servlet based application using NetBeans, Tomcat, and MySQL. It also has a couple of sample web application which is great as a project for beginners. You will learn the true real world programming while building that application. It also teaches about security issues on a web application, essential for real world stuff e.g. Cross Site Scripting or SQL injection. Overall a fantastic book to learn Servlet and JSP in quick time. This is the most up-to-date book to learn Servlet and JSP at the moment. It covers Servlet 3.1 specification and JSP 2.3, which is what you need to develop Java Web application. Like Murach's book, this one also covers a wide range of topic including essential Servlet e.g. ServletContext, Filer, Session Management, FileUpload, Listener to essential JSP, JSTL, Expression Langage and Custom tags. It also covers how to develop a web application using MVC framework like Struts 2 and Spring MVC. It also introduces with essential J2EE technology like Java Mail, Java Persistence API (JPA) and Java Database Connectivity (JDBC). Overall an excellent and complete and most important up-to-date book to learn Servlet and JSP. Even though this book doesn't cover Servlet 3.0 API and Asynchronous Servlets, it is still the second best book to learn Servlet and JSP. It was used to be the best book to learn Servlet and JSP because of its unique style and excellent content but since it has not been updated from a long time, It loses that title to the first book in this list. For a complete beginner i.e. who have never heard of Servlet or JSP, this is still a great book to start with. You can start learning from this book and then read Servlet specification and Java documentation to update yourself with latest Servlet development. That's all about three best books to learn Servlet and JSP. 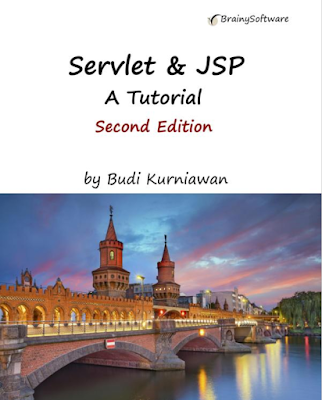 As I said, Head First Servlet JSP is great but not most up-to-date hence you should either look at Murach's book or Servlet and JSP by Budi Kurniawan, which covers both Servlet 3.1 and JSP 2.3 along with other essential Java EE technologies. If you come across any good book to learn Servlet and JSP feel free to suggest as well. Thanks for reading this article, if you like my book recommendations then please share with your friends and colleagues, it makes a lot of difference. If you have any suggestion, feedback or you think there is a wonderful book which needs to be included in this list, then feel free to drop a comment. JSP in 2017????? Kill it with fire! Murach's Java Servlets and JSP - you nailed it there, that book was phenomenal.